You can find ceramic plate 'Talavera Kaleidoscope' by Alonso Luis in tableware categories such as Floral Dinnerware, Talavera Dinnerware, Ceramic Dinnerware and Dinner Plates Dinnerware. Enjoy exploring these sections for other Novica treasures. Alonso Luis has received a $1500 microcredit loan with 0% interest. Proceeds were used to hire additional assistants for his workshop, so he can increase production for the holiday season. This ceramic decor is a true masterpiece! Looks great hanging on walls or shelves! 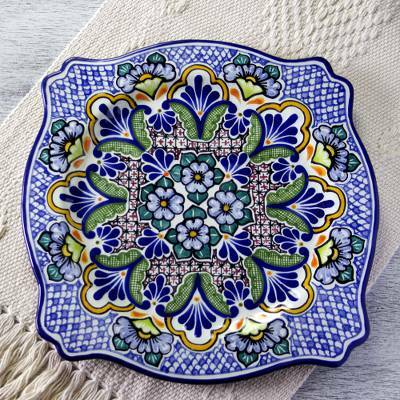 "Talavera cermic plate Talavera Kaleidoscope"
Alonzo, Thank you for the Talavera ceramic serving plate, 'Imperial Blooms.' I ordered it for my mom for Mother's Day, and she absolutely loves it! She immediately hung it on her kitchen wall. It looks beautiful. The beautiful bowl I purchased has become a centerpiece for the table and is so attractive that it's almost a shame to use it for anything but display purposes. Purchased the Talavera Clock to add to my Latino decor in my kitchen. Very beautiful and well done. Great item, thank you.